The exposed brick and natural light at The Stockroom at 230 in Raleigh made for a great backdrop for this blackberry styled wedding shoot. The fondness of the photographer’s memories as a child picking blackberries with their grandmother was the motivation. And the end result is a delicious and delightful wedding scene inspired and captured by Blue Barn Photography. The invitation suite is comprised of a simple blue-gray design thanks to the delicate lettering from Milk and Honeycomb. The bride wears a simple strapless A-line gown with a sweetheart neckline. Her bouquet pops thanks to the pretty ribbon from Adorn Company and a collection of colorful blooms. The blue-gray color was used for the bridesmaids’ looks, as well. Each lady wears a different style, all with long silhouettes for a cohesive yet unique look. Mena Garcia and Teighla Norris did a splendid job of creating a natural look for the ladies’ makeup and hair, respectively. Their bouquets, although simple, incorporate the theme with small sprigs of blackberries alongside roses and greenery. Stephanie Scholl provided the design and styling and left no detail untouched. Blackberries are used throughout, not only for flowers and treats, but for décor. A tray of vintage drinkware is beautified with sugar rims and blackberry garnish. Other stylish details include letters, assorted styles of ribbons and gold trays placed about the room. Place settings are styled using stone charger plates, gold-rimmed china from the collection of the photographer’s grandmother, and classic flatware. 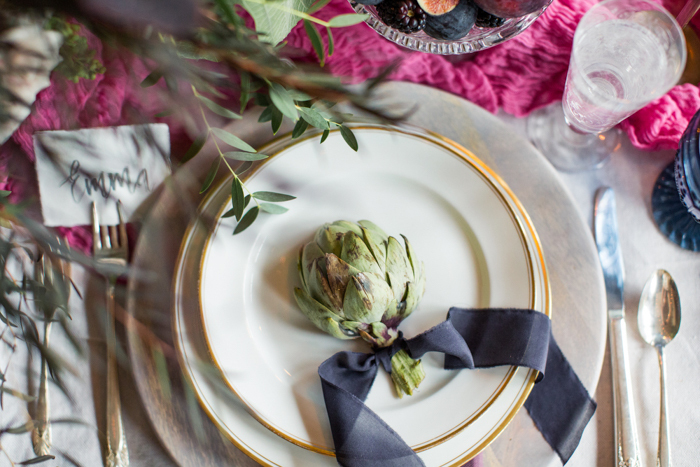 An artichoke with a ribbon tied to its stem is a unique touch. Vintage blue drinkware along with a bright hand-dyed cheesecloth table runner add a welcome pop of color on the white table. One nifty idea incorporated on the table is a small handwritten place card held up by the tines of the fork. Simple and sweet! Above the table, the string lights cast a romantic glow for the attendees, while the natural light from the windows warm up the venue’s appearance. Sugar Euphoria designed an exquisite wedding cake. Three blue tiers are wrapped with purple ribbon. Each tier is adorned with small flowers and the creation is topped with a flower and fig decoration. A vintage gold stand serves as the dessert table. The groom is styled in a light gray suit and pink tie for the perfect complement to the bride's simple style. Together, they share ample laughs in the warm and inviting venue. Outside, the bride holds a sizeable bouquet with dark purple ranunculus, assorted roses, greenery, and dark purple foliage, showing another side to the photographer's blackberry vision. Maybe they’re foraging for their own blackberries or simply taking in the scene, but this bride and groom look naturally comfortable walking hand-in-hand through the field. For the photographer, it was important to incorporate personal mementos to outfit a styled shoot straight from their own traditions. What they didn’t count on was a scene so beautifully fruitful that others could certainly be inspired to revisit their own memories, as well for wedding encouragement.